Key Difference: The brand name Retina display describes a type of LCD screen that tends to have a higher resolution than their previous models. Generally speaking, a Retina Display may have a resolution of about 300 pixels. A regular display, on the other hand, is very varied and can have a higher or lower resolution depending on make and type. Many people believe that Retina display is some new ground breaking technology that revolutionized the screens. However, that is a gross misassumption. While, some people may prefer Retina displays the truth of the matter is that the retina display is nothing more than a brand name, used primarily for marketing. Whether or not the Retina display is better than other screens on the market is debatable, though it should be noted that retina display is just one of the many different types of screens available in the market. The brand name Retina display describes a type of LCD screen that tends to have a higher resolution than their previous models. 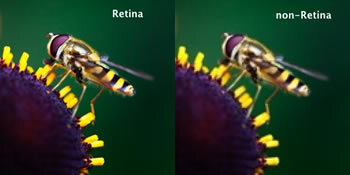 Generally speaking, a Retina Display may have a resolution of about 300 pixels. This pixel density allows a seamless image to be depicted. This basically means that from a distance of 10 to 15 feet, the individual pixels on the display are not visible; hence the images and text appear to be richer and crisper than older models. A regular display, on the other hand, is very varied. Depending on the type and make, a display can be an LCD, an LED, or something else entirely. Also, resolution on a regular display can vary. Some cheaper or older display may have a lower resolution, whereas a better or a decently prized screen may have a higher resolution. The term Retina display was created and used for marketing by Apple Inc. While, a Retina Display may be better than a traditional old display, there are a number of displays available on the market that have a better resolution than Retina. The Retina Display is one of the selling points of the iPhones and the MacBooks. However, as all companies are trying to outdo each other in terms of performance and better graphics, they are constantly trying to improve the resolution of their screens. 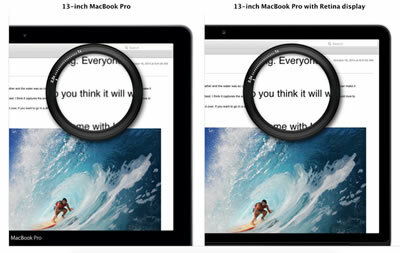 Hence, there a number of smartphone or laptop displays that have better resolutions than Retina. Still, there are a number of factors that contribute to the quality of the display rather than just resolution. It is also due to this that many people tend to prefer Retina Displays over other types of display. Currently, the iPad's Retina display is manufactures by Samsung, while the MacBook Pro, iPhone, and iPod Touch displays are made by LG Display and Japan Display Inc. All of these companies, in addition to many other manufacture other types of displays as well. A brand name for the high resolution display used by Apple Inc. The generic name for various different types of displays, which can include both high and low resolution displays.